In a culture that seeks quick results, we must learn the beauty of effort, patience, and perseverance. Be strong, present, and steadfast. Have you ever told yourself that you’re going to make something happen and then nothing happened? That’s because you didn’t follow-through. You didn’t have the right rituals in place – little things you do each day that build up and gradually condition your body and mind to make things happen. Rituals define you. All the results in your life come from your rituals. If you’re out of shape and overweight, you have different rituals than someone who’s physically fit. If you’re fit, you jump out of bed early every morning and sweat before preparing a healthy breakfast. If you’re out of shape, you sleep in and eat whatever is fastest and easiest. This may be a bit of a generalization, but it’s not far from the truth for the average able-bodied person. In all walks of life, you don’t suddenly become successful. You become successful over time from all the little things you do every day. You fail to check the books. You fail to make the call. You fail to listen to your customers. You fail to push yourself to do what must be done. And then one day you wake up and your business has failed. It was all the little things you did or didn’t do along the way, not just one catastrophic event. You change nothing and expect different results. – There’s a saying that the definition of madness is doing the same thing over and over again and expecting different results. If you want to improve yourself, you have to try new things to see what works and what doesn’t. If you keep doing what you’re doing, you’ll keep getting what you’re getting. Often the difference between a successful person and a person who struggles to implement positive changes is not one’s superior abilities, but the courage that one has to bet on one’s ideas, to take calculated risks, and to take steady steps forward. In other words, some people sit and wait for the magic beans to arrive while the rest of us just get up and get to work. You keep waiting and waiting and waiting for the right time. – You cannot wait for the perfect time; it will never come. If you think this moment feels like the wrong time, think again. It’s just uncertainty messing with your mind. Most of the time you must dare to jump. Today is the first day of a new beginning – the conception of a new life. The next nine months are all yours. You can do with them as you please. Make them count. Because a new person is born in nine months. The only question is: Who do you want that person to be? Right now is the right time to decide. Your planning and focus are in disarray. – Do you plan your days? Did you wake up today knowing what you wanted to accomplish? If not, maybe it’s time you do. Trust me, a year from now you will wish you had managed your time properly today. What would you regret not accomplishing this year? What would you regret doing an abysmal job at, simply because you waited until the last minute and then rushed around doing 50 things at once? Create a plan to accomplish these things sanely, one at a time. Planning doesn’t have to be long and tedious; it can just be a 60-second process. Every night, think about three small things that you want to accomplish tomorrow and write them down. When you wake up in the morning, review this list before you do anything else, and then take the first step. If you find yourself being lured to do something that’s not on that short list of three things, bring yourself back and focus. You refuse to accept necessary risks. – Living is about learning as you go. Living is risky business. Every decision, every interaction, every step, every time you get out of bed in the morning, you take a small risk. To truly live is to know you’re getting up and taking that risk, and to trust yourself to take it. To not get out of bed, clutching to illusions of safety, is to die slowly without ever having truly lived. Think about it: If you ignore your instincts and let shallow feelings of uncertainty stop you, you will never know anything for sure, and in many ways this un-knowing will be worse than finding out your instincts were wrong. Because if you were wrong, you could make adjustments and carry on with your life, without looking back and wondering what might have been. You refuse to take responsibility. – Not every event in your life is your fault, but they are all your responsibility. A combination of your decisions and external factors for which you had no control brought you to where you are in the world today. Negatively blaming someone else, or some other past circumstance, will change nothing. Positively taking full responsibility for your situation and your path forward can change everything. Leave the unchangeable past behind you as you diligently give yourself to the present moment. In this moment is every possibility you seek. Take responsibility for it, and bring these possibilities to life. You avoid the truth. – Personal transformation and growth can be remarkably rewarding, but only when the process of change is based on honesty and truth. When you’re not being authentic somewhere in your life or with someone in your life, any attempt at transformation eventually leads to anger and frustration. The truth always creeps back up on you; it does not cease to exist when you ignore it. Being fake about any aspect of your existence slowly digs a dark void in your soul. Life will simply not work for you if you don’t show up as YOU. The truth may not be easy to deal with, but it will always set you free in the end. You let a few negative people fill your mind with garbage. – Of course, there will inevitably be a few people in your life who will be critical of you regardless of what you do or how well you do it. If you say you want to be a dancer, they will discredit your rhythm. If you say you want to build a new business, they will give you a dozen reasons why it might not work. They somehow assume you don’t have what it takes, but they are dead wrong. It’s a lot easier to be negative than positive – a lot easier to be critical than correct. When you’re embarking on a new venture, instead of listening to the few critics that will try to discredit you, spend time talking to one of the millions of people in this world who are willing to support your efforts and acknowledge your potential, respectfully. You keep telling yourself the wrong story. – Forget what everyone else thinks of you; chances are, they aren’t thinking about you that often anyhow. If you feel like they always are, understand that this perception of them watching you and critiquing your every move is a complete figment of your imagination. It’s your own inner fears and insecurities that are creating this illusion. It’s you judging yourself that’s the problem. You judge yourself by telling yourself a story inside of your head. Every moment of every day you’re telling yourself this story. You are building your future around this story, so tell it right. Create a positive narrative about your dreams and goals that include only the circumstances that matter. What you think others are thinking about you is not part of this narrative, and neither are your negative self-judgments. You want and expect things to be easy. – Easy goals don’t exist. A goal is a point of achievement that requires effort and sacrifice. There are no esteemed ventures worth participating in that don’t require some level of effort and struggle. Decades from now when you’re resting on your deathbed, you will not remember the days that were easy, you will cherish the moments when you rose above your difficulties and conquered goals of magnitude. You will dream of the strength you found within yourself that allowed you to achieve what once seemed impossible. So don’t do what’s easy, do what you’re capable of. Astound yourself with your own greatness. You have forgotten the importance of helping others, too. – It’s one of life’s great paradoxes; when you serve others you end up benefiting as much if not more than those you serve. So if you feel stuck right now, shift your focus from your circumstances to the circumstances of those around you. As Gandhi once said, “The best way to find yourself is to lose yourself in the service of others.” Instead of asking, “What’s wrong with me?” ask, “How can I help you?” Find someone who could use an extra hand and make an offer they can’t refuse. When your focus shifts from your own confusion and difficulties, to the confusion and difficulties of others, and you see yourself making a positive difference, it fills you with a sense of meaning and illuminates a clear path to a brighter future. You aren’t taking small steps every day. – Every moment of your life builds upon the next. This moment is the bridge between the reality of where you are and the vision of where you want to be. Reality is approaching you every second. And the great thing is, you’re able to alter it as it arrives. You just have to decide what you want to do with it. The greatest of all mistakes is to do nothing simply because you can only do a little. In fact, it is far more productive to take many small steps in the right direction than to make a giant leap only to stumble and fall and never get up again. The path to every goal requires a hundred small steps – one after the other. Figure out where you want to go, take a step, and keep on stepping. Diligence and persistence will get you there. What has been stopping you from moving forward? What rituals (or habits) do you want to change in your life? Leave a comment below and share your thoughts. A great post. For some people this may seem like career or business advice. But for me it speaks directly to relationships. Items 11 & 12 really hit home with me. It’s so tough to know what one can and cannot do to improve their life; what to let go of and what to hold on to. Thanks. I am working on letting go of a few of these stuck habits myself. And it’s interesting because somebody who is naturally confident and driven tends to have trouble with many of these things. I’m finding as I let go of my negative emotions and replace them with a more mindful/thankful presence, I am more able to let go of these kinds of negative habits. Thanks again for being there. Your coaching and written guidance helps me move forward almost every day. I really need these positive reminders in front of my face on a regular basis. Hey Marc and Angel, I know I’ve left comments in the past thanking you, but I just want to remind you that what you write about is really helping me through a tough year. Since January I’ve been suffering from mild to moderate depression based on the simultaneous and surprising loss of a job and a close, long-term relationship. Your words really give me direction and make me realize that there is more to life than to being upset and stuck in my past problems. Like Fay, for me it really is all about positive reminders, which is why I have read and re-read your parts of book and many of your articles several times over the past year. Doing so has helped me stay on the right path. So I’m sending gratitude your way today. This post spoke directly to me on so many levels. I plan on reading this again and answering the questions at the end. Thank you for this. Thank you for putting into words what I have felt so strongly about for so long, but have not had the words to express or the courage to act upon. I have a lot of drive too, but still struggle with moving forward in my career – of giving up something comfortable so I can make a leap forward. I have stalled out of fear and self-doubt far too many times. And this post really helps. I really appreciate your emphasis on the small steps we take each day. “Consistency” is one of my keywords for the year and I feel it makes all the difference in the world. #2 describes my fears of letting go of my 30 year marriage . It’s easier to stay but I merely exist . Fear of the unknown keeps me from making that necessary change and I am headed downhill. Fast. I will try your exercises . Thank you for this article . This is my first comment and I wanted to say I enjoy reading everything you both write. Thanks Marc. This is the little kick I need. I am working on getting myself together but recently have become discouraged because I am not getting the results I thought I should by now. I have gotten frustrated and slacked off a bit but I got up today determined to get back on track and I received your post. It was perfect timing. I tend to also lay blame. It is always easy to blame someone else for my struggles as it prevents me from facing the truth. Yes I have had difficult times and even though most is beyond my control there were things I could have done differently that I didn’t and that puts me in a tight spot. I am working my way out and needed a push and motivating myself to forge ahead I was further encouraged by you post. Thank you very much for this posting. Number 12 fits me perfectly. 1, 2, 3, 4, 7 & 15 totally resonate. I tend to procrastinate taking small things too lightly until they pop up as a giant one day n then i feel frustrated. I do realize the fault all the way, but I dunno how to get over with it. I also find it hard to diversify my fields of study (I’m a student going for an examination that requires plethora of know how n learning across all the subjects, science, non-science, social sciences n all that). I get frustrated what to study, for how long, when to stop, how to manage things n sometimes i find after weeks that I’ve missed the important altogether. This article should help, it’s a great one. Though I’d be glad to get some advice on time management n consistency. Thank you. I’d like to thank you for finding me at the right moment in my life. I’ve had a difficult five years having been through some big personal traumas on top off the daily life bits and bobs. Your advice and readings give clarity to my otherwise jumbled mind. When I step back and read everything I feel like you’re actually talking directly to me. You have helped me a lot and I hope I can pass forward as much love and attention as you dedicate in your writing. This post is definitely a motivational booster. While moving forward, we must focus on our main task without thinking about the negative people. People will definitely say something or other. We can’t stop them. By shifting our negative energies of rejection to positive thoughts, we can definitely move forward in a positive manner. Ya, we all want everything in a perfect manner. In this process, we try to force things so much that we don’t realize the true fun in our work. And I completely agree with your small steps point. As Rome was not built in a single day, we must focus on small things only. Number 15 really resonates with me. Sometimes I wish I could just take one big step to get to the goal quicker, but of course that’s not how it works. It’s learning to have the patience to take those small steps, no matter how small they may seem, that will eventually get us there. Forward progress is always better than no progress or going backwards instead. Hi Marc and Angel, I think this post was like a subliminal message for me. I’m stuck at all of them. I have been going through so much that for the past year and I can’t see it getting any better soon. I’ve been ill since Christmas, need more tests for that. And I am going through genetic counseling now. I just started this, and I am still numb. I am high risk for breast and ovarian cancer. I really didn’t think it would apply to me at all, but it turns out it does. Oh, and I almost forgot too, the separation. So for me, I do well to just put one foot in front of the other, but I live in a total fog. And I live with my 90 year old Mother. I am going to print this out and keep it with me. Thank you both for being there, and I’d better get back to my classes! Much love to both of you! What an amazing and insightful post. Thank you so much for taking the time to post this. I stumbled across your website at a time by own own actions I ruined a 28 year marriage and lost a deep connection with my son and was basically homeless and down to my last few dollars and deeply depressed, suicidal and living in the past. I wrote to friends and whined about poor me and get responses how two friends lost their son’s to drug overdoses but mine was alive, one friend had a heart attack and nearly died but didn’t complain, a long time friend died and I was dwelling inside self. I opened my eyes and with the help of strangers I’ve begun to rebound and instead of blaming others – I just have to accept the past for being just that, a past and step forward each day. I found work something that fits me, finding a new path and reconnecting with lost friends and souls. Your website is a good connector to what I was and what I will be. The greatest thing that stopped me from moving ahead was the fear of failure, but I realized that sooner or later you have to face your battles and avoiding them is not making them go away. Though I believe that the best way of learning is self realization, posts like these do help pushing me in the right direction .. Thanks a lot for spelling it out for me. I swear you’re like my Jiminy Cricket on my shoulder who is my conscience when I need it most. I had to stop to wipe away tears here multiple times out of sheer guilt. How can a person claim to want something so badly, yet fail at the follow-up so abysmally? It’s well past time that changed, and without pushing forward, there would never be any advances in anything! Thank you for pricking my pride enough to tell me what nobody else had the nerve to. Thanks Marc and Angel number 13 is still a real problem to me, but I am now going to do away with it. Hi Marc, I love this article. I can see many things that keep my own clients from moving forward. And I have found that in my field, which is healthy eating and weight loss for women, #8 You avoid the truth is very often what keeps people stuck. They know they overeat or snack too often or eat too many convenience foods, but they won’t admit it to themselves. Once they admit the truth as a cold hard fact, and not as something that makes them feel guilty or not enough, they can make great and fast progress. This spoke to me as I was discouraged this morning about my weight loss journey, and provided me with encouragement to keep going, be patient, abd speak to myself with love. It also helped me with regards to relationships, and centering myself too. Thank you for your wise words and constant help! As usual, another timely and insightful piece of writing and I thank you for it. These pieces always seem to appear as I’m dealing with some challenges in these areas. Currently, I’m being challenged with making some huge changes regarding moving to another city and embarking on a career and being met with mental uncertainties and anxieties because the process is not going as smoothly as I would like. Within these 15 points quite a few speak to my situation and I have to apply them to my current process and see where I’m falling short and need to adjust my thinking, beliefs and actions. I may actually open up the dialogue here to get some tips from others who have made moves to other cities and embarked on new careers there for some assistance. Thanx for the insight Marc. 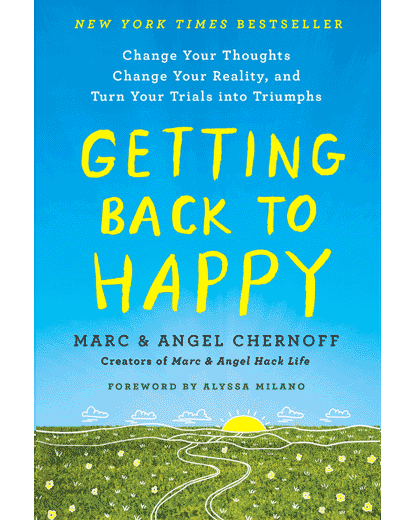 Just joined “Getting Back to Happy.” And the first thing I feel is fear. I am going to copy this article and tape it to my journal. It never ceases to amaze me how comfortable being uncomfortable really is….until…I feel that nagging pull that “something” has to change (hmmm maybe not so comfortable after all) and then I realize the footwork that will be needed to make that change and fear and doubt sets in so, going back to that uncomfortable place is more familiar and I go back there only to start the whole cycle again…I think that is a great definition of living my life insanely. For me the realization at 53 and really free of any physical illness is that I am no longer younger getting older, I am now older getting older. I cannot change that my body will weaken one day but my spirit doesn’t have to and I want to embrace the rest of the life I have left. I want to feel alive, not stuck. I want to take responsibility for my journey. And I love your sentiment. There is no doubt that being present is a vital part of living life to the fullest. No matter your circumstances, this moment will be part of your story someday. It’s not right or wrong. It’s not perfect. It just is – a blank canvas – a completely unrestricted space that you can use as you please. To laugh. To get rambunctious. To muse. To create. To express your freedom to be as you are. The past no longer exists in reality, but only in our mind. Being in the present might be easier said than done, but it’s a necessary skill to learn if we want to keep progressing as a person. I am a recovering perfectionist, and now a member of Perfectionist Anonymous (PA), just a little humor. The reality is that recovery amounts to giving myself permission to RELAX…and enjoy the moment. After all, life is virtually….one embarrassing moment….after another, and now…I am enjoying the journey, the song, and the dance…….. This has been a good reminder for me, as I move forward in life. Don’t be afraid to make decisions that seem irrational on the outside – yet feel totally right on the INSIDE. Thank you to everyone that shares your story, experience, and words of wisdom. I loved reading this post! I had to go through an illness that derailed me for a couple of years, to learn most of this. A blessing in disguise really. Marc, you still keep amazing me… every time I read one of your articles I get inspired no matter what. Even if I am in the laziest mood, I still manage to get up and do the things I need to do. I think what stops most people from doing what they want to do is actually themselves. They are afraid from what society would say about them, that’s how people are these days, we care more about other people opinions, than ours. A sad fact, but it’s a fact. A lot of truth in this article! Thanks for reminding me what habits to avoid! Great article! Very good points! I feel really inspired to move forward! Thank you!